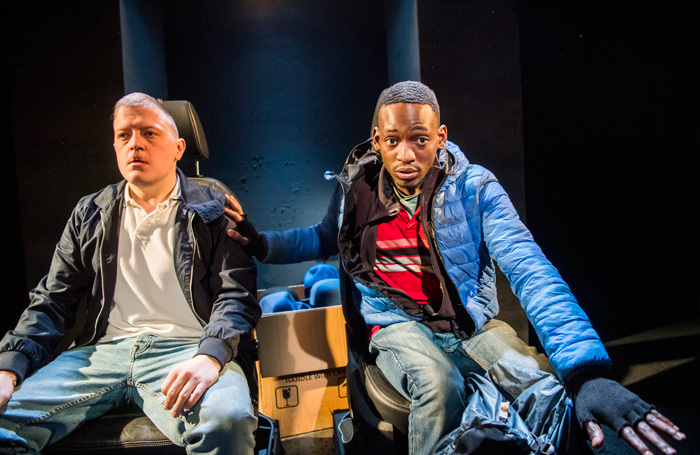 It is a play about stop and search right? No, it is a play about “interrogation and surveillance”. Somewhere, everywhere someone is being interrogated and somewhere actually everywhere, everyone is under surveillance. Do you get the picture? Gabriel Gbadamosi paints the picture with his tale of lives that connect by a similar narrative, an existence dominated by fear and suspicion. There are three scenes, the opening scene, two people in a lorry one is the white driver Tel, (Shaun Mason’) who is like a fire cracker about to explode at any given moment he has the world on his shoulders, with a van filled with people who he is helping cross the border, a girlfriend he cannot control and a more than an average dose of paranoia. He has just picked up Munashe Chirisa’s Akim, an African immigrant who says little, but he too is burdened with ghosts, his child drowning, both living in a state of unrest. Tel voices his fear of Muslims and being blown up. He interrogates Akim about his name to ensure it is not a Muslim name. Cast: Munashe Chirisa as Akim,Tyler Luke Cunningham as Lee David Kirkbride as Tone, Shaun Mason as Tel, Jessye Rome as Bev. Gabriel Gbadamosi is an poet and playwright. His theatre credits include Eshu’s Faust (Jesus College, Cambridge), Hotel Orpheu (Schaubühne, Berlin), Shango (DNA, Amsterdam); and for radio, The Long, Hot Summer of ’76 – winner of the first Richard Imison Award. Gbadamosi’s novel Vauxhall won the Tibor Jones Pageturner Prize and Best International Novel at the Sharjah Book Fair. Artistic Director of Arcola Theatre Mehmet Ergen is an award-winning director. His recent theatre credits for the company include Richard III, Bliss, The Cherry Orchard, Drones, Baby, Drones, An Enemy of the People, The Cradle Will Rock and Clarion.